The Okovango is a rare example of an inland delta where the river fed from the Angolan mountains disappears into the sands of the Kalahari desert. It is the home of many unusual and spectacular birds and animals including several species of bee eater, the Pell’s fishing owl and the tiny lechwe a species of marshland deer. 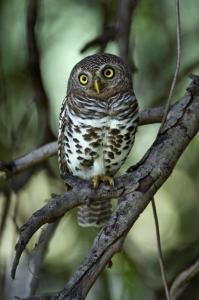 The picture is of a barred owl another Botswana speciality. Geoff will also be talking about his encounter with the bushmen of the Kalahari and their traditional life style. Presented by Geoff Trinder from Doncaster.